late Hon. Philip Stern, K.C., J.P., Advocate (mayor of Kingston and Clerk Honourable Legislative Council) 1927-1928; embarrassed 1928; Assistant News Editor, "The Blackman," 1929-1930; Religion: Roman Catholic; Politics: Nationalist; Publications: "Society Gossip" 1926; "Literary Comments" 1926; "Rum and Ginger" 1929; "Jamaica Hot Sauce" 1930; King George V Pictorial Souvenir, 1936; Editor-Publisher, "Scan Magazine" 1940; engaged for Special Service (Jamaica) World War II, accredited British War Correspondent (Capt.) and European Representative Jamaica Press Association 1945-1946; Married July 25, 1934, Millicent Ruby Thomson; has one son and two daughters: Clubs: Botanical, Lucas Cricket, Jamaica Press, Royal Societies (Lond. 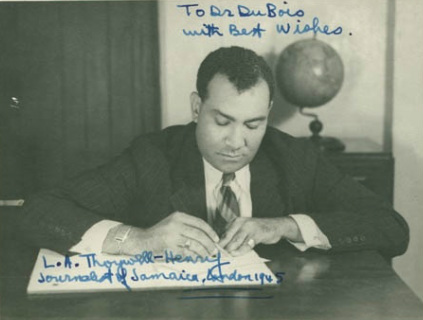 ), Hispanic; travelled European Continent, U.S.A., Cuba and British Honduras; presented with Silver Plaque and Mahogany Carving at Public Dinner, Kingston, Sept. 23, 1943; Addresses: 107 Water Lane and "Stratmore," 8 Outlook Avenue, Bournemouth Gardens, Windward Road P.O., Kingston.